Gold prices rallied in the mid-week session Wednesday to close at a six month high and extend a winning streak to three sessions. Gold for April delivery advanced $23.80, or 1.8%, to settle at $1,370.50 an ounce on the Comex division of the New York Mercantile Exchange. The price was the highest since gold ended at $1,386.70 an ounce on Sept. 9. "Open interest in gold futures and options has jumped, and price action says this new hot money is all bullish," MarketWatch quoted Adrian Ash, head of research at BullionVault. "But the market doesn’t look over-stretched yet. The [speculative] net long position almost tripled between New Year’s and last week." In heavy volume, gold prices ranged from a low of $1,345.60 to a high of $1,371.30. The yellow metal so far this week has gained $32.30, or 2.4%. Silver for May delivery surged 54 cents, or 2.6%, to close at $21.36 an ounce, snapping a string of losses that began on Friday. 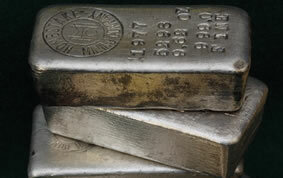 Silver prices traded between $20.82 and $21.44. April platinum rose $11.70, or 0.8%, to $1,476.30 an ounce, ranging from $1,458.30 to $1,481.80. Palladium for June delivery gained $6.65, or 0.9%, to $777.15 an ounce, trading between $762.10 and $779.15. Sales totals of U.S. Mint bullion coins were unchanged Wednesday as of 4:35 p.m. ET. American Eagle coins in gold and silver have sales this week that already surpass those of last week. Additionally, on Monday the U.S. Mint re-introduced its bullion American Eagle palladium coin after a 5-year hiatus. Below is a sales breakdown across U.S. Mint bullion products with columns offering the number of bullion coins sold on the week so far, last week, in February 2014, the month-to-date, and the year-to-date.